Tanzanian president John Pombe Joseph Magufuli commends the “serious and credible” efforts made by Morocco for a “lasting solution” to the Sahara issue, says the joint statement released following the official visit paid by King Mohammed VI to Tanzania Oct.23-25. Tanzania supports Morocco’s position and stands ready to contribute to the implementation of UN relevant resolutions on this issue, adds the joint statement. President Magufuli also backs the efforts of the United Nations seeking “a just, lasting and mutually acceptable solution” to the Sahara issue, stresses the document. On the African scene, the Tanzanian Head of State hailed the leadership shown by King Mohammed VI in promoting peace, stability and development in Africa. He also paid tribute to the Moroccan sovereign for his South-South cooperation, based on pragmatism, efficiency and public-private partnership. 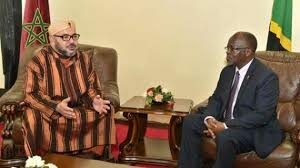 President Magufuli voiced his country’s full support to Morocco’s bid to rejoin the African Union and to retake “its legitimate seat”, saying that he would defend Morocco’s return to the African institutional family during the next AU summit. They also called for the immediate suspension of the membership of the self-proclaimed RASD, which was illegally admitted in 1984 at Algeria’s pressures and petrodollars. Written by: Peter Mulvany on November 2, 2016. Last revised by: Jaber Ali, our reviewer, on November 3, 2016. Posted by Peter Mulvany on Nov 2 2016. Filed under Headlines, World News. You can follow any responses to this entry through the RSS 2.0. Both comments and pings are currently closed.